New Touch-Screen Controller! This new controller allows switching between jobs. It's as simple as pushing a pre-select key on the control panel. Simply pre-program each of the four possible selections with different combinations of time and temperature, then simply toggle between the selections. You can also use it as a 2-step selection within the same job. For example the controller can be set to handle two alternating cycle times (ie: one for a pre-press, followed by one for a final press). Digital timer is adjustable up to 999 seconds. Full adjustable pressure control (pneumatic) Up to 89 PSI of inline pressure. Calibrated digital temperature adjustable to 450F. Deep over-slip for dressing shirt. Lower the handle to start the automatic cycle. Long lasting pneumatic air cylinder lift system. Applies all types of transfers on items up to 3/4" thick. Lifetime warranty on heating element. 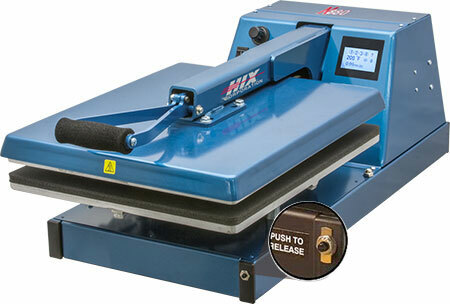 If you should see any of these heat presses we offer advertised for less, we will meet or beat the price!